Eastern Catalytic Converters are certificated in over 58 countries around the globe. Continual improvements in design, production, and product delivery systems have made Eastern the smart choice in Direct-Fit catalytic converters. Eastern Catalytic provides catalytic converter coverage for cars, light trucks, SUVs, and vans. Each catalytic converter is built to meet or exceed OEM specs with OE-quality flanges and flex assemblies. They feature proprietary catalytic converter chemistry and high-flow design that maximizes engine output and catalytic efficiency. Eastern Catalytic utilizes nanotechnology, which is the manufacturing and manipulation of materials at the molecular or atomic level, guaranteeing you a well-built, long-lasting catalytic converter. The Direct-Fit Catalytic Converters include Eastern’s Value Pack™ installation kits with everything you need for a fast, easy installation. The most accurate way to determine converter failure is by tests such as those used in state and local inspection programs. (a rattle in this kind of substrate indicates that the substrate has separated). 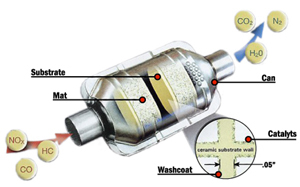 The catalytic converter helps control harmful emissions from mobile engine sources by converting the hydrocarbons (HC), nitrogen oxides and carbon monoxide (CO) in the engine’s exhaust into carbon dioxide (CO2), nitrogen (N2) and water (H2O) vapor. for the application of the washcoat and precious-metal catalysts. This is the clean-air enabler at the heart of the catalytic converter. Washcoat—A coating in which the catalysts are suspended that increases the surface area of the substrate. When applied, it forms a rough, irregular surface that provides more places for precious-metal catalysts and makes the converter more efficient. Catalysts— A combination of precious metals that is suspended in the washcoat before application to the core. Chemical reactions between the catalysts and engine emissions help convert noxious emissions into less harmful gases and water vapor. Mat—A wrapping surrounding the catalyzed substrate that provides thermal insulation and protects against mechanical shock and chassis vibration. Mats are available in a variety of densities, thicknesses, and compositions. Can—A metal package that encases the catalyzed substrate and mat, and integrates it into the exhaust system.